Adviser Investments has been ranked in the top 30 of Barron’s list of “The Top 100 Independent Wealth Advisors” in its Sept. 17, 2018 issue. The rating is based on a combination of qualitative and quantitative factors that include assets under management, revenues, regulatory records and size and experience of each firm’s team. 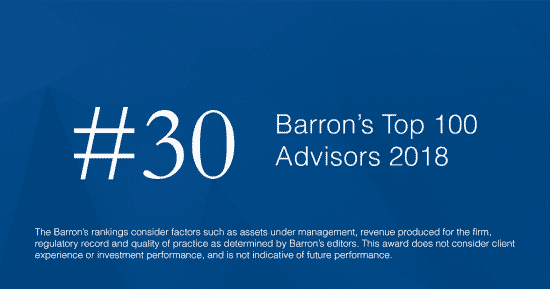 The Barron’s rankings serve as an industry scorecard for wealth management professionals and a resource for individual investors seeking financial guidance and wealth management. To be nominated, advisers complete a detailed survey about their practice. Barron’s then conducts its own due diligence analysis and the resulting pool of candidates is then further screened to determine the country’s top 100 advisers. Inclusion on the Barron’s list once again places Adviser Investments among the country’s elite independent wealth managers. What distinguishes the firm from many of the other highly ranked advisers is that its clients represent a much broader swath of the investing public—including retirees, emerging affluent individuals and families alongside trusts, institutions and company retirement savings plans—rather than solely high-net-worth investors. Despite managing over $5 billion in assets, Adviser Investments has maintained its longstanding commitment to delivering the personalized service of a small firm while providing the full range of top-tier services common to larger companies to its diverse client base. The Barron’s accolade is one of several that Adviser Investments has earned of late. Earlier this year, Barron’s also recognized Adviser Investments among the top 10 firms on its list of the “Top Massachusetts Financial Advisors” for the sixth year in a row. The Financial Times included the company on its 2018 list of 300 top RIAs (the FT 300). InvestmentNews ranked Adviser Investments among the top 10 on its inaugural 2018 list of “Best Places to Work for Financial Advisers.” Most recently, the National Association for Business Resources included Adviser Investments on its 2018 Boston’s Best and Brightest Companies To Work For® list—the company’s third consecutive year achieving this honor. With more than 3,500 clients and $5 billion under management, Adviser Investments is one of the nation’s largest registered investment advisers. Our wealth management professionals focus on helping individual investors, trusts, foundations and institutions meet their investment goals. Adviser Investments’ minimum account size is $350,000. InvestmentNews’ Best Places to Work for Financial Advisers Award is based on responses to surveys voluntarily completed by participating firms. Firms do not pay a fee to participate. InvestmentNews conducts the survey, evaluates participating firms’ ability to attract and retain talented employees and then ranks the firms.